A splendid article by Nigel Biggar on Cambridge University’s shoddy treatment of Jordan Peterson. Drawing lessons from the Peterson incident and his own experience at the hands of intolerant progressive academics, Biggar argues that the Cambridge administration is guilty of rank hypocrisy. When one puts Cambridge University’s serial inaction in the case of Dr Gopal alongside its precipitate action in the case of Professor Peterson, what is revealed is this: the University does in fact discriminate on the unjustifiable grounds of race, gender, and above all morals and politics. If you’re non-white, female, and aggressively ‘woke’, then you’ll be accorded maximal benefit of doubt, given a pass on official norms of civility, let free to spit hatred and contempt on social media, and permitted (probably) to malform and intimidate students. However, if you’re white, male, culturally conservative, and given to expressing reasoned doubt about prevailing mores, you’ll be given no benefit of doubt at all. And, should you do so much as appear to transgress ill-conceived norms of inclusiveness, you’ll be summarily and rudely excluded. The implications are grim. Students or academics who are thinking of applying to Cambridge for a place on a course, a teaching or research post, or just a visiting fellowship, should either scrub their records clean of anything that might appear transgressive of the reigning orthodoxy, or turn elsewhere. And if they do get to be included, then they should take care to suppress their doubts, bite their critical tongues, and go into Inner Exile. Sad to see that great British institution heading the way of Trescott University. 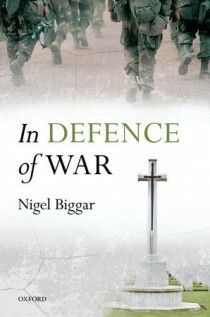 Last year I posted an approving review of Nigel Biggar’s In Defence of War. One topic Biggar doesn’t directly address in his book is the ethics of nuclear deterrence. This omission he has now remedied with an excellent article on the moral and practical rationale for nuclear deterrence and the role of the UK in holding nuclear weapons. His argument is particularly important in light of the sweeping electoral victory in Scotland enjoyed by the SNP this week and their stated position on the UK’s Trident programme. In Defence of War is an excellent book with a somewhat misleading title. It isn’t a defence of war per se, but rather a defence of just war theory in the Augustinian Christian tradition and, by way of application, of three relatively recent military engagements involving Western nations. As Biggar explains in his introduction, one of his major targets is “the virus of wishful thinking”: the idea that there always must be a course of action better than military conflict. Justice entails that war is sometimes not only justifiable but necessary.